We were blown away with how GOOD these enchiladas were. They tasted like something straight out of a Mexican restaurant. We have been on such an enchilada kick lately and have been trying so many different versions from chicken to ground beef and now shredded pork. All versions are amazing. The rub for this pork is one I use often and is just about the same as the one I use for My Favorite Shredded Pork Tacos. I have served this homemade creamy red enchilada sauce several times over beef enchiladas, but this was the first time I served it over pork enchiladas. The two paired perfectly together. Serve them on a big plate with a side of Mexican Rice and refried beans and it will look and taste like a restaurant meal. For the Pork: Trim fat from pork. Combine remaining ingredients to form a paste and rub all over pork ribs. Cover with plastic wrap and allow to marinate for at least an hour or up to overnight. Place in a dutch oven and add about 1/2 cup - 3/4 cup of water or chicken broth. Cook in a 300 degree oven for 2 1/2 - 3 hours or until meat easily shreds with a fork. When done, remove pork to a separate bowl and shred, adding some of the juice from the dutch oven. For the Enchilada Sauce: Melt butter in a large skillet over medium heat. Whisk in the flour, one Tablespoon at a time, until a thick paste forms. Allow to cook for several minutes to cook out the flour taste, stirring frequently. Slowly whisk in the chicken broth. Continue whisking until it is smooth and creamy. Cook for a few minutes or until slightly thickened. Add the enchilada sauce and cumin. Cook for another 5-10 minutes or until desired thickness is reached. Stir in sour cream. Reduce heat to low. To Prepare: Preheat oven to 350 degrees. Add about 1/2 cup of sauce to a baking dish. Heat tortillas in the microwave for 15-30 seconds or until pliable. Divide shredded pork evenly between tortillas. Top each with a little cheese and chopped cilantro. Roll up and place seam-side down in a baking dish. Cover with remaining sauce and remaining cheese. Bake for 15-20 minutes or until cheese is melted and bubbly. Then, broil for a few minutes to brown the cheese on top. Serve. Jenn's Notes: The number of enchiladas you will get will depend on the size of the tortillas you use and how full you fill them. I can fit up to 6 enchiladas in an 8x8-inch casserole dish. Yummy, you have convinced me to try these! Maybe these enchiladas will get me out of my Mexican food slump! If you do end up trying them, let me know what you think! OMGoodness! 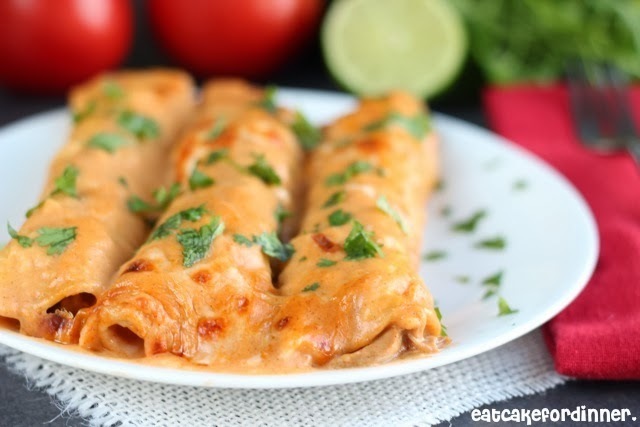 Enchiladas are one of my favorite things, and I just love this sauce. Can't wait to make this recipe! Thanks for sharing! We love enchiladas in my house!! 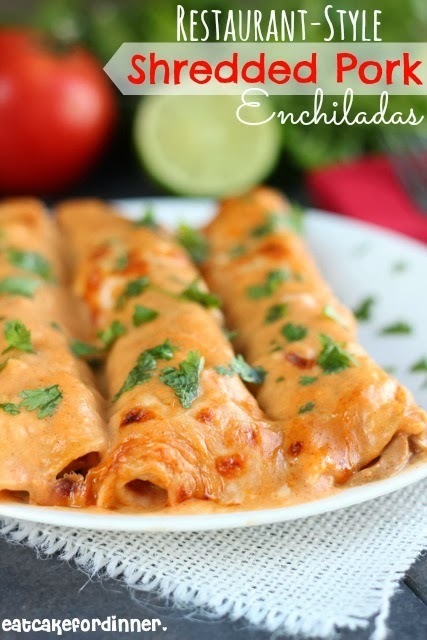 I most definitely need to try these pork enchiladas!! I have be out of the blogging world for awhile--I have missed so many yummy dishes on your blog. I do love enchiladas--one cannot have too many recipes! Absolutely delicious! I made these with my pre-cooked and shredded pork I keep on hand, and just added the marinade once thawed and let it sit for an hour before filling the tortillas. So yummy! I am so glad you liked them - thanks for letting me know. Great idea using pre-cooked pork. I love enchiladas. Never tried them with pork. Everything looks delish! Just made these with some pork carnitas we had leftover. This recipe is so good! I especially loved the enchilada sauce. My husband had seconds and even took the leftovers for lunch the next day. This one is a keeper!